You are taking part in a “Dig” using the ACE Archaeological Simulation project, and you have to record what you find in a “professional” manner.The teacher will decide where your simulated Dig istaking place, and the types of artifacts you are likely to find will depend partly on the location. However, remember that under Roman rule, there was quite a lot of trading going on between different parts of the Empire. For example, in Britannia, amphorae of wine were imported, as were certain foods such as dried raisins, from the Mediterranean region, and household goods such as Samian ware pottery from Gaul. The site of the dig should be laid out so that each square of the grid has a reference number, and the job of the excavation team is not only to uncover the artifacts carefully, but also to record each item and where it was found, and, if your dig is deep, at which level or stratum the object was found. Dig carefully with your spoon, removing the earth into an earth container, which later can be sieved for any missed items. As you come across artifacts, label them with an individual consecutive ID number and the grid section in which they were found. Note your finds methodically in columns or on separate sheets per grid square, giving a description of the item and after that the initials of the person who found it. Do a rough drawing of the item you have found or take a photograph of it, then put the item into your finds boxes. In A1, layer one (the top layer – 2 ins from the surface) we found . . .
On a large sheet of paper with the grid drawn on it, everyone can note the identification number of the items they found in the grid square where they found it, so that an overall picture emerges. If your paper is large enough, students should do rough drawings of the items. Some ideas for things that are not only fun to do, but also are realistic re-enactments of dig practices are . 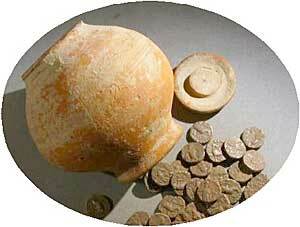 . .
1) Roughly date the coins – are they all from the same period, or did ancient Romans live at your site for several hundred years? 2) Are there signs of habitation at later periods? 3) Are there signs of trading – through imported items which would not have been available naturally at your site? 4) Are there any signs of what the original inhabitants of the site ate? 5) Try and re-assemble your “ancient” broken pot. 6) What sort of building was at your site? 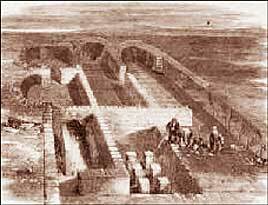 Write an essay describing life at your dig site during the Roman period.